In response to reports of an increased use of low-quality or aftermarket filters, Air Science developed a resource to help you identify suitable replacement filters. Our ebook, Filter Integrity (link), details the problems caused by filters purchased from unauthorized suppliers, outlines the activation process of carbon filters, and discusses related performance standards to help you better recognize and assure replacement filter quality. As one of the most important pieces of safety equipment, filter integrity is essential for your work and your workers. While cheap filters may seem like a benefit due to cost savings, low-quality replacement filters, including aftermarket, homemade, or DIY carbon filters, are dangerous. Cheap replacement filters not only jeopardize safety by creating undetected workplace hazards, they can also void your equipment's manufacturer warranty. Regardless of the manufacturer, your ductless enclosure includes filter specifications that are essential for the safe operation of your cabinet or fume hood. Air Science sources quality, activated carbon filters from Filtco Filters, an authorized producer of replacement carbon filters that comply with the requirements of more than 25 major ductless enclosure manufacturers. To continue to protect laboratory personnel from potentially harmful vapors generated on the work surface, carbon filters must be changed on a regular schedule. Effective filter adsorption and chemisorption are, however, entirely dependent on initial filter quality. 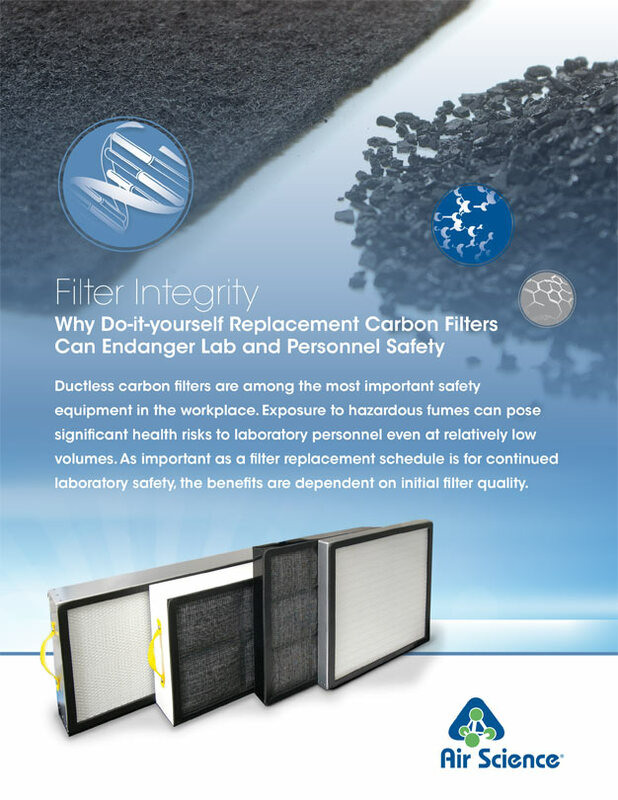 Learn how to identify quality replacement carbon filters and read more about how activated carbon filters function in our free ebook: "Filter Integrity: Why Do-It-Yourself Replacement Carbon Filters Can Endanger Lab and Personnel Safety."